You’ve probably seen plenty — squall lines are long lines of severe weather that most often precede cold fronts. 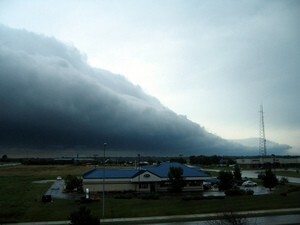 A squall line can approach from the horizon with a line of low-hanging, dark clouds. Squall lines often move very quickly. If you see one coming, be sure to take cover quickly. After all, squall lines are notorious for producing heavy rain, hail, high winds, lightning, and tornadoes.